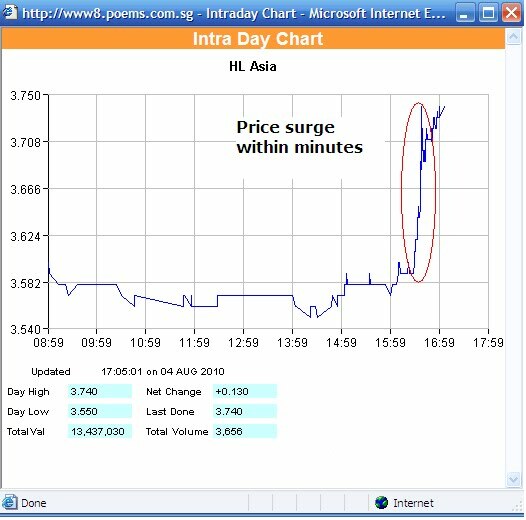 HL Asia - A late day break out was spotted around 4.45pm. near closing time. 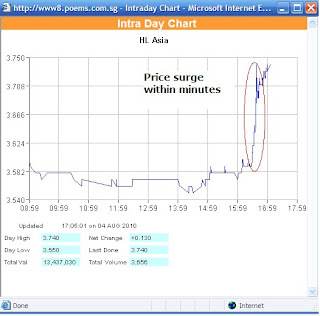 Price surge 3.59-3.74 within minutes! I suspect there is strong accumulation, to reason out the spike in the price today. If you have followed my previous post, I have posted this stock has a ascending triangle chart pattern, once broken it will have a high chance of going higher. In addition, It ended at the highest point of $3.74, hence signify that there is no much seller in the market for the day, hence a bullish candlestick is formed.